We discovered this to be a very nice family campground! They have the usual amenities including a large pool with waterslide and several excellent playgrounds for kids. The restrooms were clean and well maintained and the staff was helpful and friendly. The campsites are gravel and relatively level but fairly close together with little or no cover between them. Many of the sites have light to medium shade. You do feel a little crowded, especially with so many kids running around and thru your campsite. 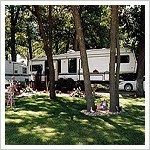 The campground is well-landscaped with lots of flowers shrubs and grass. It’s really a great family campground, and easy to get to… about 13 miles from I-35 and directly across the street from Clear lake. The campground also has own boating and fishing docks. Kiesler’s can be an extremely busy park during the summer, especially on weekends with tons of kids! If you’re looking for some peace and quiet, you won’t find it here. If you have kids, this is an excellent campground to call home for a week or two.